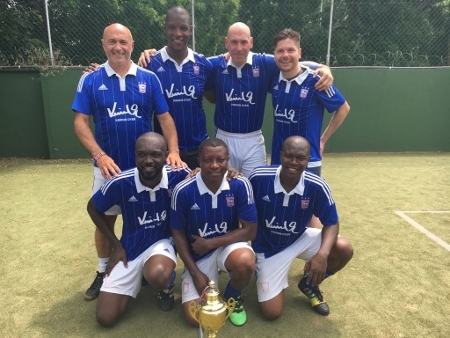 Former Blues defender and current academy coach Titus Bramble is the lead coach and ambassador of Futurestars and told TWTD about his role in the project. “I first went out in 2016 just because I always wanted to do some charity work when I was retired from football and Milts having a project there it was a no-brainer,” Bramble said. “The first time I went for a month and every time I go now it’s for a minimum of two, three or four weeks, it just depends on work. “It was a something I’d never experienced before, I’d never been to Africa. It was just a case of throwing myself in the deep end. “I don’t think you can really get a feel for somewhere after a week, so I thought if I’m going to go somewhere, let’s go for a month and see what it’s really like. Bramble, who is next in Ghana for the annual Futurestars Festival of Sport in October, says he had an idea of the culture from playing alongside Ghanaians such as Asamoah Gyan. “I’ve played with a lot of Ghanaian footballers, so I’ve always known how much fun they are and they just love to sing and dance and are just happy people. Bramble outlined his role when in Ghana: “In the mornings before school we start at 6.30am and until 8am there are open football sessions, so anybody is welcome to come and play football and train with our two coaches. “The good players will get selected for our development centre which is four times a week. The same with netball, where again there are open sessions and the good players will get selected for our development centre, which is once a week on a Friday. “I’m involved in the PE programme, the football before school and the netball sessions as well, which is quite interesting not knowing netball myself, it’s something I’m learning as I go along. “I’ll walk round the schools, see the teachers and talk to them, it’s just a case of building relationships. “There are five schools we work with so I don’t just want to just be working with the two football coaches. The 37-year-old says he sees progress in the project on each occasion he returns: “Every time I go back there it just goes from strength to strength, people are seeing what we’re doing and are liking what we’re doing and helping to spread the word, which is really good. “Once you see the project and see what it’s about, you know how good it is and the lives we’re changing, which is obviously what we’re trying to do. “The coaches are fantastic, you can see the work they do and the relationship they have with the kids is fantastic. 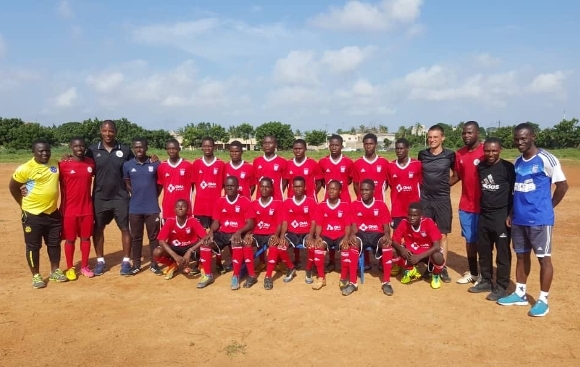 Does Bramble, who works as Town’s U16s coach, see a difference between the youngsters he works with here and those in Ghana? “I think kids over there, in my opinion, seem more hungry because they come from a lot poorer backgrounds, they see football as an outlet to get away from poverty,” he reflected. “A lot of kids in the academy come from wealthy backgrounds, which is not their fault their parents have money, and some kids tend to lose a bit of hunger because everything is handed to them on a plate, whereas kids in Africa come from nothing and see football as a way to get out and something to get them away from poverty. “They all love football and they see that a lot of Ghanaian footballers and African players have played all around the world, so they can see it’s possible. 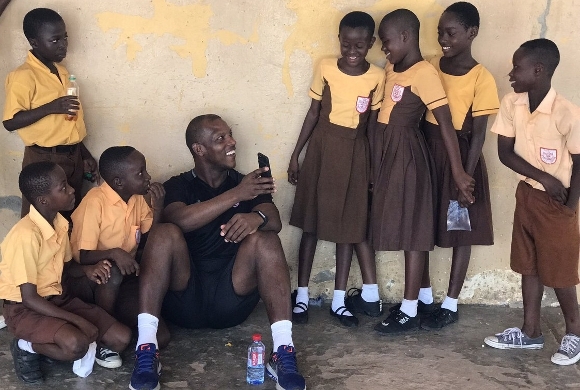 Last year Bramble took some of the Futurestars coaches to meet some of those Black Stars heroes: “One of my friends is friends with Avram Grant [the Ghana manager] and the national team were preparing for a game I spoke to my friend who spoke to Avram Grant and he said we could come along. “I spoke to Asamoah and told him we were coming along and he was great. We had pictures, watched the training session and then went in the dressing room to meet all the players. “The coaches really loved that because they will have grown up watching these players. It was great for them. “For me it was a thank-you for the work they’re doing while we’re here. Stuff like that, they’ll really appreciate that. Going forward, the plan is to forge links so the development centre players can continue to receive coaching into their late teens. “I seen a big difference over the two years and the hard part is now finding [a way of taking the coaching on],” Bramble added. 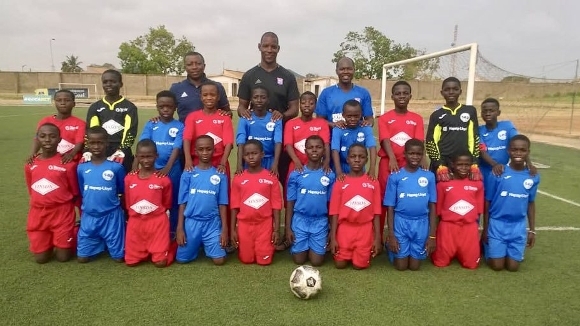 “In Ghana we stop at 14 so we’re trying to find a way to get a local academy to partner up with so that when they get to 14 they then go into another academy which is under our umbrella so we can keep an eye on the players and keep them going and developing as footballers. “Togo is slightly different because they’ve got an academy from nine to 20 so they’ve probably got the better players at the moment because they go from nine, they go for lots of training and they’re there until they’re 20. “Out of the two, the Togolese have probably got the better footballers but that’s not to say Ghana haven’t got some very, very talented footballers, but the Togolese have had more training, which is something we’d like to do in Ghana. “Togo is like our academy here, but from nine to 20, a proper academy. They’ve had success, they’ve had boys and girls representing the national team. He says the way children play impromptu games of football in Ghana and Togo reminds him of when he was a youngster and something he feels has largely disappeared from Britain these days. “When I was growing up you’d go over the park and you’d see everybody playing football, whereas now that park football and street football is non-existent here, but in Africa you drive down a street and you’re going to see football everywhere you go. That’s a shame. “Most of us grew up making our own entertainment but now there’s a generation with phones and iPads and iPods. Going there reminded me that there are other forms of entertainment. To see everyone interacting and making their own games was again refreshing. He says Ghana is a country of great contrasts: “I think Accra is a fantastic city, there are so many beautiful places in Accra, that’s what surprised me because you have Africa in your head as a poor continent, and don’t get me wrong, there is real poverty, but there are some really amazing places which I didn’t really expect. “We call it work, but it’s like a working holiday. We’re up at six, at the schools at 6.30 but then you’re out in bars and restaurants until midnight because they’ve got such good restaurants and bars. 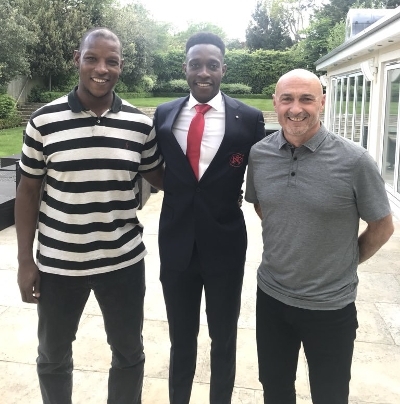 Bramble is trying to get other footballers involved with Futurestars: “We had a meeting with Danny Welbeck just before the end of the season, he’s got Ghanaian roots, so we went and sat down with him and his brothers just to talk about the project and potentially getting him involved. “When people hear charity the first thing people think about is money, so we said to him we’ve got big companies in Africa that are putting a lot of money in so we don’t need your money, it’s just a case of giving something back like I said I wanted to give something back. “I’ve no Ghanaian roots, but for a Ghanaian to put something back into their own country would be amazing. “And that’s what we want him to do, come and look at the project and however little and however much he wants to do he’s very welcome to do it. “We’ve spoken about that and there are a few others we’ve spoken to it’s just finding a way for them to get involved. “Jeffrey Schlupp at Crystal Palace, he’s another friend of mine and again I spoke to him about it and they’re all keen to get involved, it’s just a case of when we can get them out there. “Once we’ve got enough of them we’ll maybe organise a game or perhaps maybe at one of our festivals to play in a five-a-side, stuff like that. “We’ve got all these ideas and have spoken to a lot of players and they’re all keen on it because it’s such a good project. Fantastic read, huge admiration for Titus for his work in Africa. Sounds like it's proving very rewarding and fulfilling for Titus being involved in this excellent project. What a wonderful uplifting article. Please could TWTD give regular (half-yearly?) updates on both the Ghana & Togo schemes. A huge well done to Milts & Titus ! Please keep up this great work. Credit to you Big Man you are doing great work over there. Cannot believe Titus is 37 ! He is doing a great job for the right reasons. perhaps even Trump would approve ! michael99. Try thinking about the point you put forward. I expect Titus is probably well of, hence he could just swan around enjoying life. He has however chosen to give something back to society instead. many in his position dont. Well done Titus. And Michael I hope you have a long and happy life. Michael99 - I’d be very interested to understand your reasons for such negative comments. Titus clearly made mistakes in his younger days. Just like many teenagers or young adults do. Footballers get money, attention and temptation before unfortunately maturity. The difference being their mistakes get in the papers and they get targeted by manipulators. What is important is that people give back when they can and do the right thing as they get the chance. This is a good story of somebody giving back and doing good. It has nothing to do with his bank balance. Many people regardless of wealth and freedom of time, do not give anything back. I worry for people that find a negative in any positive. Also remember he always sponsored our academy even when he was playing at Newcastle. Not all bad in my books. ........ certain people in life deserve to be ignored ... !!! - too sad for their own good. Thankfully not everyone is the same - well done Titus and all - credit to you all. Brilliant work Titus et al. Must be even more inspiring for the young kids in Ghana to see such a successful black guy from Europe so involved. One of the greatest things about TWTD is these types of full pieces on senior or retired old favourite players. Great stuff.